Rob ConspiracyPsychology.com was created by Rob Brotherton. 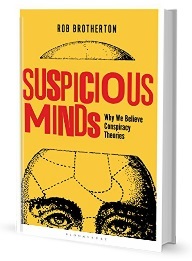 Rob is the author of Suspicious Minds: Why We Believe Conspiracy Theories, and is an Adjunct Assistant Professor at Barnard College in New York City, and Visiting Research Fellow at Goldsmiths, University of London. His research addresses the cognitive origins of conspiracy theories, as well as personality correlates and measurement issues. Dan Dan Jolley is a Lecturer in Psychology at Staffordshire University. His research explores the social psychological consequences of conspiracy theories. Specifically, he employs experimental methods to explore whether conspiracies are just harmless fun, or if they have significant harmful effects. Christopher Christopher is a PhD Researcher and Associate Lecturer for the Anomalistic Psychology Research Unit at Goldsmiths, University of London, studying conspiracy belief and persecutory delusions. The aim of his research is to explore possible psychopathological links to conspiracy belief, and also to place conspiracy theories into a wider political and social context. He is ThresherX on Twitter. Mike Mike Wood is a Lecturer in Psychology at University of Winchester. His research concerns the relationships between different kinds of conspiracy beliefs, persuasive techniques used by pro-conspiracy-theory and anti-conspiracy-theory advocates online, and conspiracy theories as a worldview or ideology.